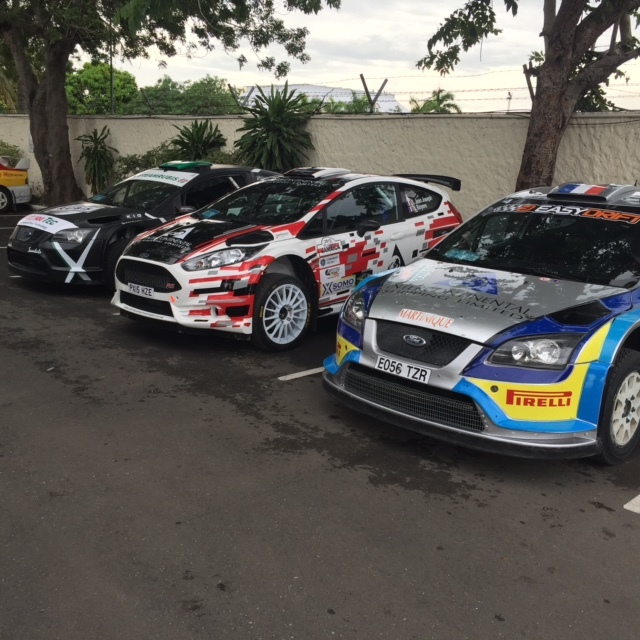 Two members of the Dom Buckley Motorsport team took the 10 hour flight over the Atlantic to the Caribbean for the 2016 Rally Jamaica. We would be involved in the running of 3 Ford’s on the event. They would start with number 1, 2 and 3 respectively on the doors. At number 1 was multiple time Rally Jamaica winner and local hero, Jeffrey Panton in his 2006 specification Ford Focus WRC with Mike Fennell co-driving. In an almost identical Ford Focus WRC at number 2 would be John Powell and Nick Telfer in John’s 2007 specification Focus WRC. 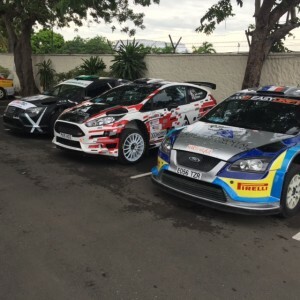 Simon-Jean Joseph would be the pilot of the brand new Fiesta R5 that was making it’s debut in the Caribbean. He would have number 3 on his door and Jack Boyere would be calling the notes. With Powell’s Focus arriving late on Tuesday night into Montenegro Bay after being shipped from his home in Trinidad, the team immediately set about swapping the car over from Tarmac spec to gravel spec. This includes changing the dampers, brakes, diffs, driveshaft’s and TCA’s amongst other things. Once that was changed over it was final checks on Jeff’s Focus and some seat fitting on the new Fiesta R5. Now all three cars were ready for a short test on Thursday afternoon. All drivers got some milage under their belt on the test. Some more than others though as Jeff’s car had a boost issue and he soon returned back to base. Simon was getting a feel for a completely new car for him and John was getting back into it after a long time without driving the car. The Dom Buckley Motorsport men got back to the workshop, washed and stripped Panton’s car to find any faults with the boost issue. Once they got to the bottom of the issue the car was built back up and re-prepared ready for another small test in the morning to double check everything was good. Powell also decided he would like another test on the Friday morning. Once again bad luck struck but this time it was John’s time. On only his 2nd run of the morning the Ford Focus WRC broke a driveshaft joint, therefore ending his test. Luckily John had a spare one and the team got that fixed in time for the start on Friday evening. Jeffrey got the test he had hoped for with a couple of set up changes and was now ready for the rally. The ceremonial start was on Friday evening but was a complete washout with torrential rain. All week on the lead up to the rally the island had suffered a battering from the rain leaving some of the stages in poor condition but it dried up enough and the organisers did their very best to get everything running smoothly. Day 1 started and Panton was the fastest man out there. Leading from the first stage he never looked back all weekend. with one or 2 small mistakes resulting in only minor time loss he set out a large lead on Day 1 and managed it superbly on Day 2 to take the win. John Powell started the rally with some really good times, 2nd fastest on stage 1 and fastest on stage 5 but he was struggling with illness and had to stop on 2 stages before continuing at road speed , both times he was caught and passed by Simon Jean Joseph. 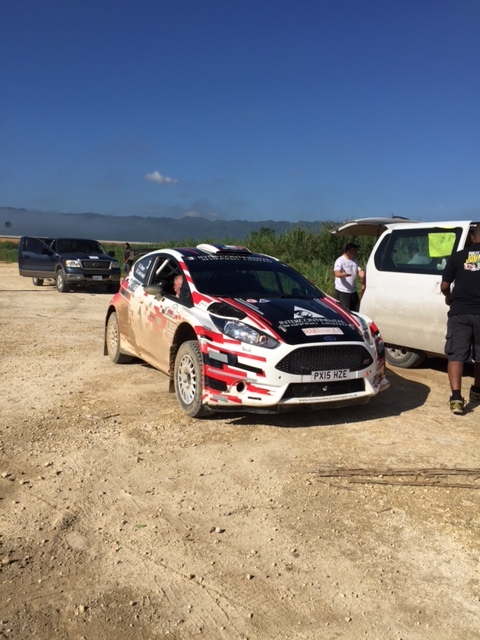 Although he dropped 2 minutes to Jean Joseph on those 2 stages alone he still lay 5th overnight. At the start of day 2, Powell was still not feeling 100% and so when he drove through the second part of the first stage of the day at road speed he decided it was time to withdraw from the rally. 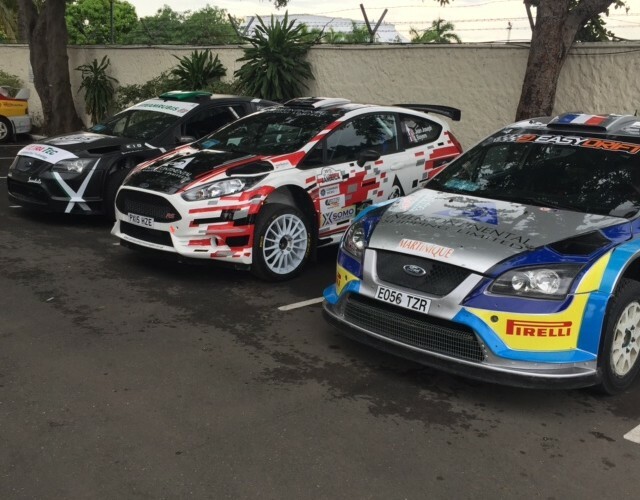 There was a lot of interest in the brand new Fiesta R5 that Simon Jean-Joseph was driving as it was the first of the R5 class to venture over to Caribbean. Jean-Joseph, who lives in Martinique is no slouch and he was nipping at the heels of Jeff Panton’s stage times all rally eventually taking 2nd overall in a strong showing for the new car. As well as getting used to the new car the conditions and local knowledge was against him in the battle with Panton and Fennell. Although the gap at the end of the rally may look like there was a run away winner, the Fiesta R5 definitely was there or thereabouts against the WRC car. After the rally the team had Monday to wash and re-prepare the cars. The Ford Focus WRC of John Powell was swapped back over into tarmac specification and the Fiesta was checked over and is now ready to go to its next event.